This is a simple combination with meat, vegetate and noodles. Perfect for a rush meal. For the chicken chop, I used boneless chicken leg. Sprinkle salt and lack pepper over bother sides of boneless chicken leg. Heat a pan. When the pan is hot, put the chicken in with skin side down to sear the chicken. Since chicken leg contains fat, I didn’t use an extra oil. Frying needs a bit more patience. Fry both sides till golden brown. Skin will become crispy. Set fried chicken aside. Use the same pan to fry mushroom in chicken oil. Also add in a little chopped garlic and fry for 2-3 mins. Cut in 1 tablespoon butter. When butter melted, add in 1/4 cup heavy cream. Stir with low heat. Season with salt and black pepper. If you don’t have heavy cream, you can use flour. When butter melted, dissolve 1 tablespoon flour in 1/4 cup water or stock. Pour it into the pan. Also pour in 1/4 cup milk and you will also get smooth and creamy sauce in this way. Add cooked linguine into the mushroom sauce and mix well. 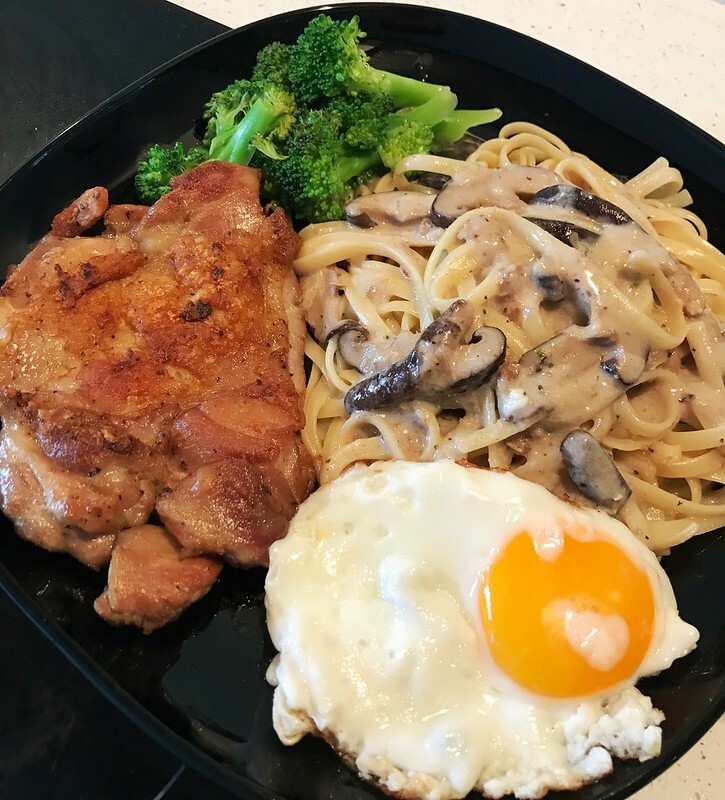 Serve chicken chop with linguine. A very simple but yummy meal. Reblogged this on Tuition Database Singapore.